Happy Monday and welcome to the week of Hawaii recaps. 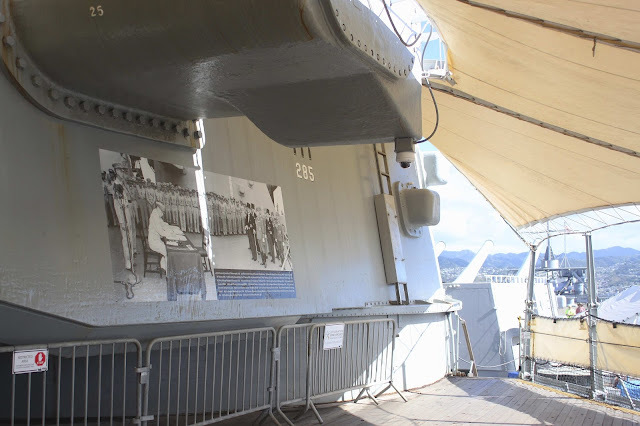 Each of my three posts this week will focus around different day trips we took from our resort at Ko Olina, and today starts with our time at Pearl Harbor. One of the main reasons we decided on Oahu is that both Mike and I wanted to see and pay our respects to Pearl Harbor. The question we probably get most after telling people we went to Oahu is how Pearl Harbor was. The instinct is just to say "great" or "fantastic," but that just seems so insensitive. While we did enjoy getting to see this historic place, we both struggle with how to describe the whole experience: somber, moving, emotional, calming, humbling, and really a must-see. 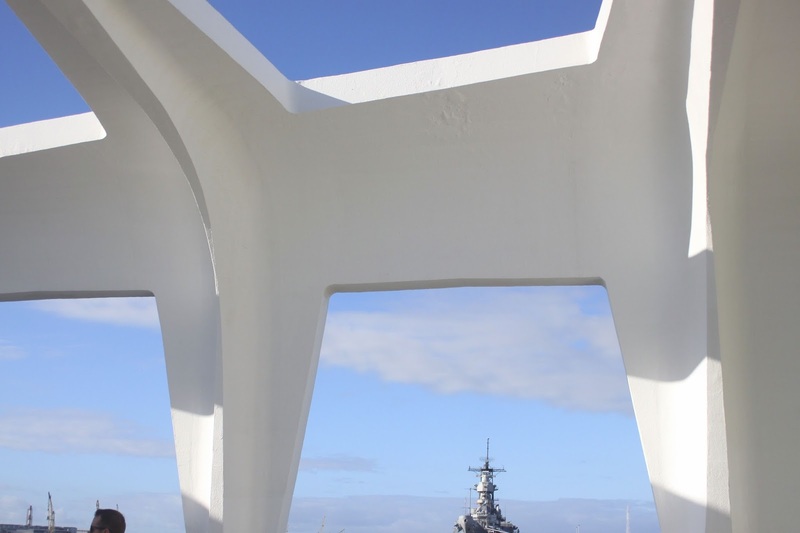 When most people think of going to visit Pearl Harbor, they think of the USS Arizona Memorial. 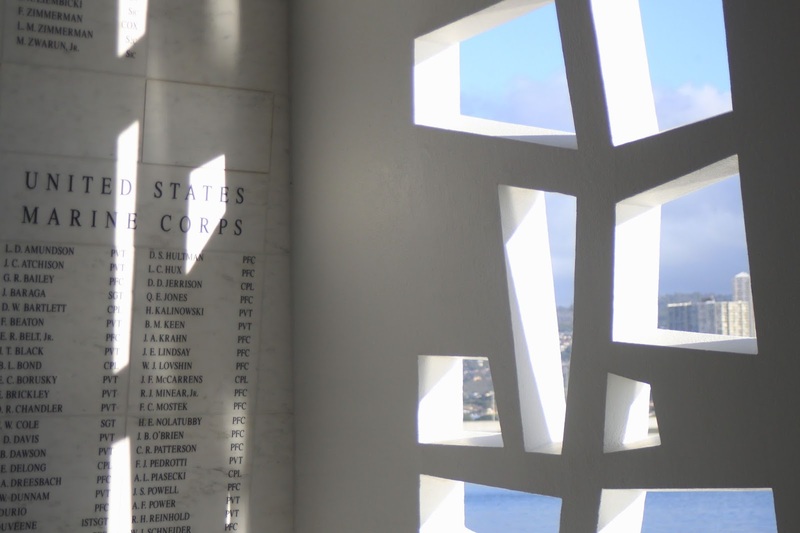 The 75-minute experience, which includes a 25-minute video, Navy-operated boat ride out to the memorial, and time at the memorial, are free, but tickets are only available online up to two months before your requested date online. Like many, Mike and I weren't sure of our plans that far in advance, so we chose to wait in line to get one of 1,300 walk-in tickets that sell out everyday. We got there right when the site opened at 7:00am, on our first full day of the trip, so that we'd still be jet-lagged and likely to wake up early. At that time, we were already about 150-200 people deep in line and got an 8:30am tour time. You are not able to choose your tour time, and they are all given out in sequential time, meaning that if you arrive at 9am, (if the tickets aren't all sold out yet), you could have a 3 or 4pm ticket. There is a small museum on-site as well as many beautiful views around the area, and we took advantage of both of those before our time slot. 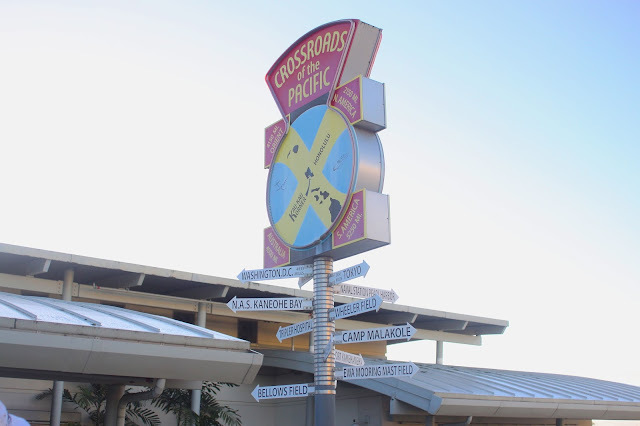 The 25-minute video gave a depiction of life in Hawaii prior to the war as well as an overview of everything that happened on December 7, 1941. It was definitely a sobering experience before we loaded onto the boat to take the five minute ride over to the the memorial. While the Arizona is under the control of the National Park Service, she is still owned by the U.S. Navy, who operates the boat service to the memorial. 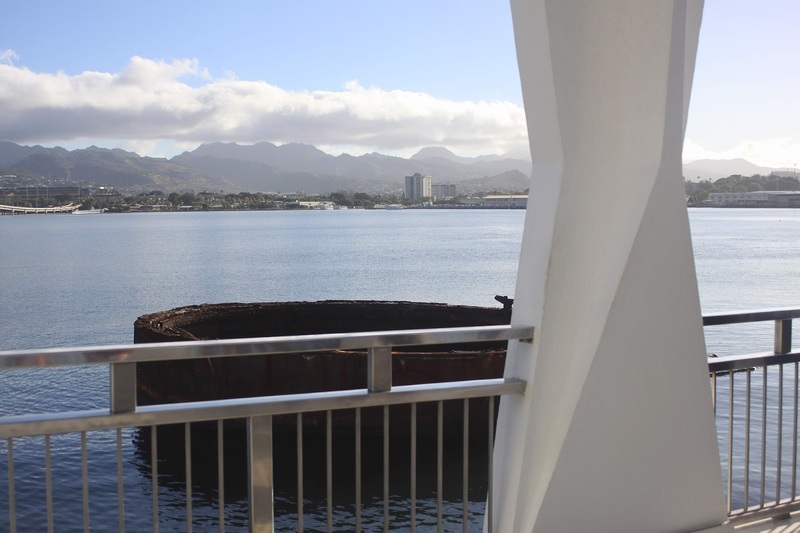 The wreck of the ship marks the resting place for 1,102 sailors and Marines who lost their lives on the ship that day and is still an active U.S. cemetery for any survivor of the attack to have his urn buried. Walking onto the memorial, there is an entryway, followed by the assembly room with seven windows on each side to commemorate the attack on December seventh. On one side, you can see the base of one of the gun turrets, just above the surface of the water, and on the other are the "black tears," where the ship's oil still leaks out, even seventy years later. 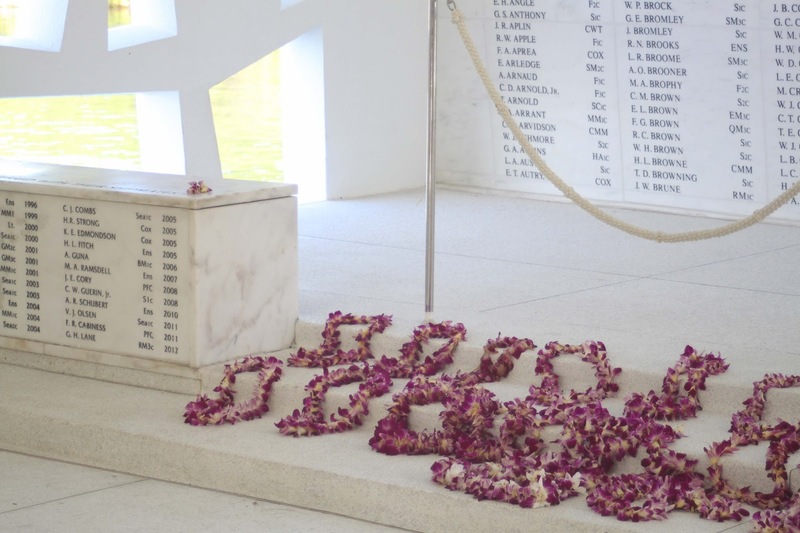 At the far end of the memorial is the shrine where each name of those buried with the ship are listed and leis are placed to honor the fallen. We spent about a half hour at the memorial before heading back to shore. 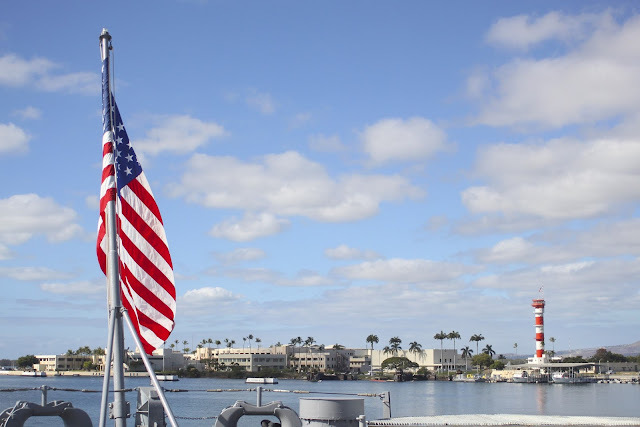 In addition to the USS Arizona Memorial, there are three partner sites located at Pearl Harbor: the USS Bowfin Submarine Museum and Park, the Battleship Missouri Memorial, and the Pacific Aviation Museum. Each of these has a small fee associated with it to help with the preservation of each site. 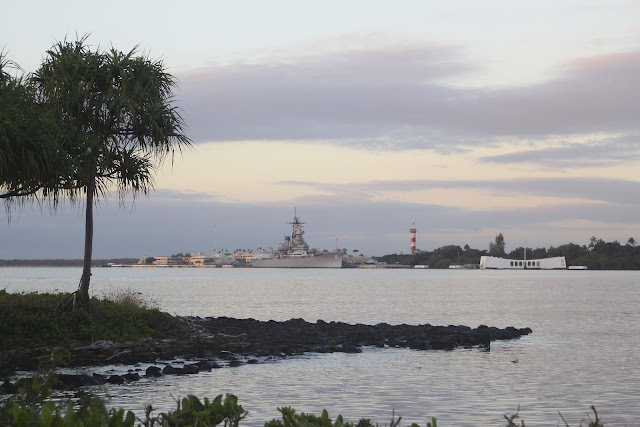 We took the shuttle over to Ford Island, a private military-owned island, to visit the Battleship Missouri Memorial, which faces the USS Arizona Memorial. 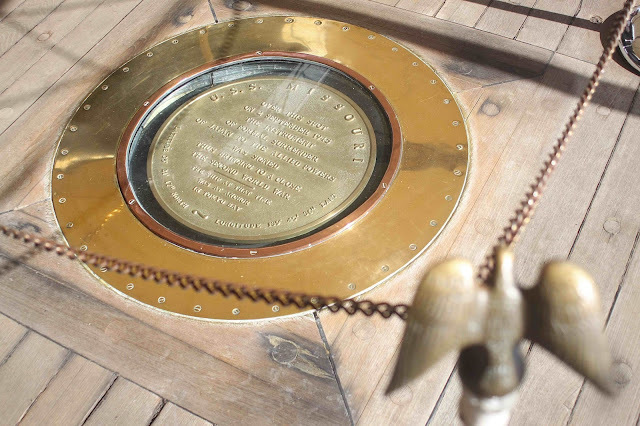 We toured the decks of the ship and even stood in the exact spot where Japan surrendered to end World War II in the Pacific. The bow of the Missouri now faces the Arizona as if to watch over her. We are so glad that we were able to see all of these historical sites for ourselves on the first day of our trip. We learned a lot about the military history of Hawaii and the geography of the area. If you travel to Hawaii, the wait to visit Pearl Harbor is well worth it. I would love to see this memorial. It must have been such a moving experience. Thanks for sharing it and sharing your pictures! This is definitely on my bucket list! This is the one reason I would be okay with getting sent there. I'm usually not a history/war/battleship type of person, but this is one thing that I'd like to go see some day. You took some great pictures while you were there! 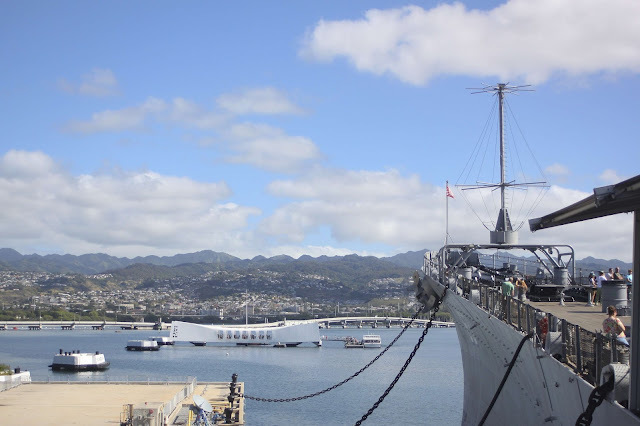 When we visited Hawaii in 2015, I really wanted to take a day and go to Oahu specifically to pay our respects at Pearl Harbor. Unfortunately the timing didn't work out, but I hope that we make it there one day. It just seems like something we should do as Americans. I can't imagine how surreal it is to visit. What a somber, but important part of history to be able to visit. I would absolutely love to go there someday! 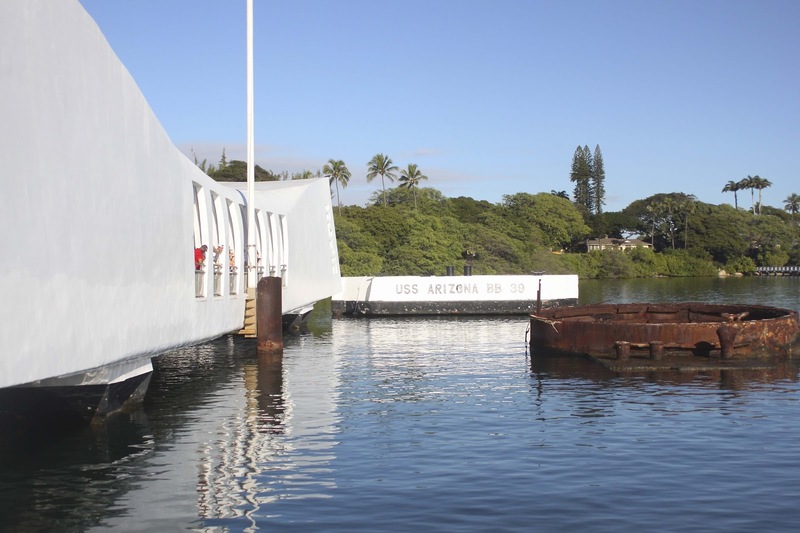 Pearl Harbor and the USS Arizona are so sombering. I have a relative who was on the Arizona when it went down so it was surreal seeing his name on the wall (even though I obviously never met him). It's just one of those places I think everyone should visit! This looks like such an amazing, emotional and moving experience and I'm so glad you were able to get a ticket. What a wonderful thing to see while you are in Hawaii. Thank you for sharing! My late Grandfather survived PH--he was 19 and had just joined the Army, so I made it apoint to stop there when I visited. A must do! This is a must-see for me when I make it to Hawaii. I agree that "cool" and other terms aren't the most appropriate for it. I'm so glad you were able to do this. I'm sure it was very moving. Years ago I toured a concentration camp in Germany. While a completely different thing, I still have a hard time coming up with words to accurately portray the feeling and emotion of being there and I'd think Pearl Harbor would be that way too. We definitely plan to visit one day. Thank you for sharing your experience and the beautiful photos you took capturing it.